I spend a lot of time in the showroom sitting on these items while talking to customers, but they aren't seats at all. 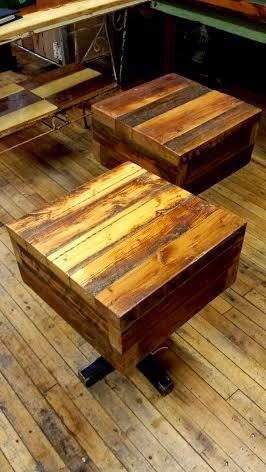 These are our Block Tables and you can find them scattered throughout the shop. 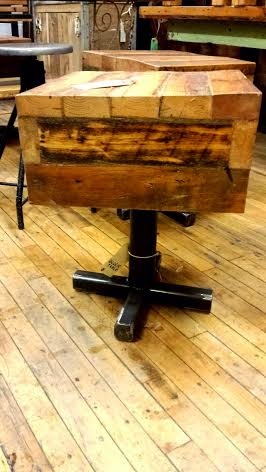 As with most everything we do, the table is made from reclaimed BC Fir from old Toronto homes and churches and the bottom is made with hot rolled steel. This table is 24 inches off the ground. The actual block is 9 inches high and the square is 18 x 18. It looks like a substantial table, but it is easy to move around because that 9 inch thickness is actually a very large lip. I can only imagine how heavy this would be if it were a solid piece of wood.